Photographs, illustrations and writing by Franke James, MFA except where noted. 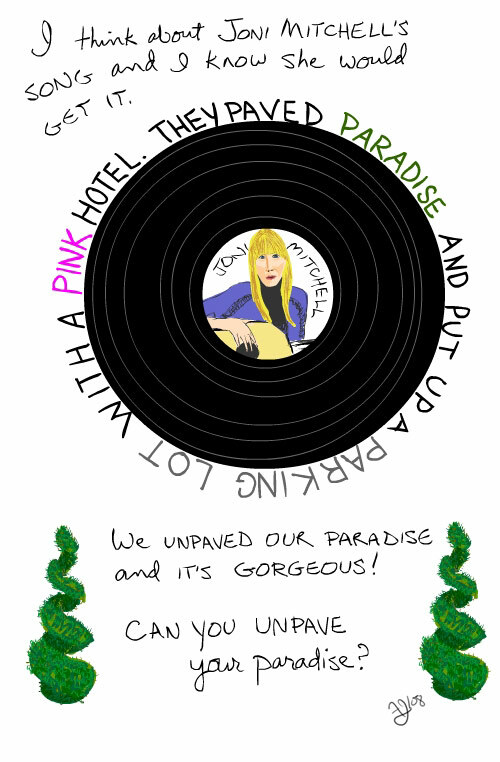 Big Yellow Taxi by Joni Mitchell, excerpt of lyrics. Many thanks to Joan Chadde, author of Understanding the Ecological Impacts of Changing Land Uses published in the Spring 2008 issue of Green Teacher, and her colleague Dr. Alex Mayer, a hydrologist in the Department of Geological and Mining Engineering & Sciences at Michigan Technological University, for their kind assistance with the stormwater calculations. The Green Driveway Articles detail the building of our green driveway step-by-step, including the materials used. 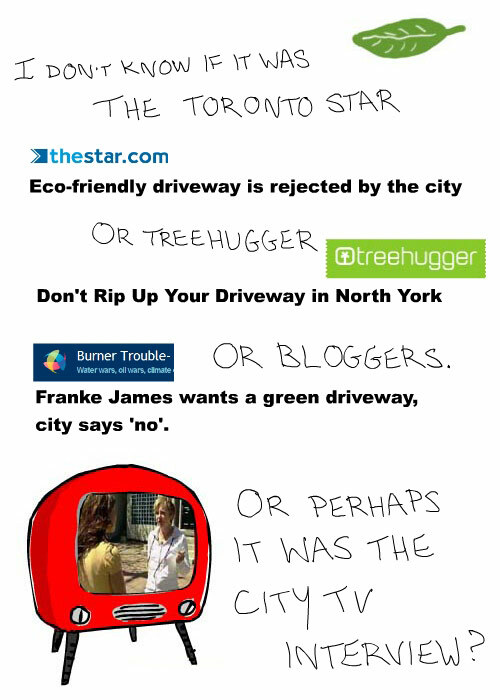 Don’t Rip Up Your Driveway in North York, Lloyd Alter, Treehugger.com, May 8, 2007 Franke James wants a green driveway, city says no. Just found your blog and am so glad I did! It’s fabulous and inspirational! Thank you! We’re hoping more people will do this! We also hope people will start yardsharing to grow food closer to home – so we’ve built hyperlocavore.com – a yardsharing community. Just about finished building our strawbale house. 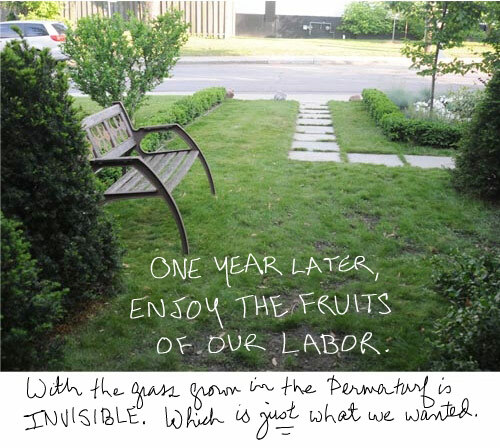 Last summer we put in the vegetable garden. This year we are putting in a permaturf driveway. Found your site to be very informative. Thanks. We are hoping to open one of Canada’s first stawbale bale bed and breakfasts on June 1st, 2009. So if you are ever in Nelson, B.C. drop by and have a look. such a great way to go green. lots of work, but considering the heat in the summer there, well worth it. guess what vancouver’s latest green initiative is? allowing people to raise chickens in their backyards in the city! The other important thing, Franke, is that you chose not to treat City Hall as The Enemy. The wars are begun in the conflicts we entertain within ourselves and play out trivially in our environs and locales… I’m so impressed and energized by your way of going about things! Maybe I can become just a bit more like you as me! More positive, creative about how to arrive at the goal. Just a hoot! I’m not sure I understand the permaturf. The grass grows through this? It looks wonderful. 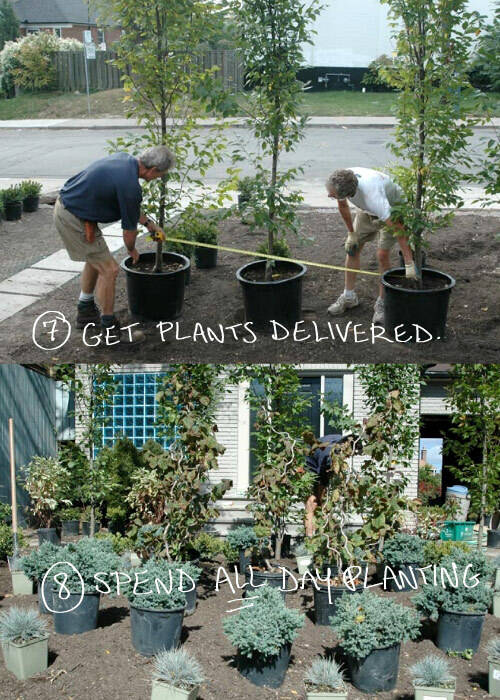 We are in the process of landscaping and I am interested in this. Good job! The technology behind our ‘driveway-free’ illusion is PermaTURF. 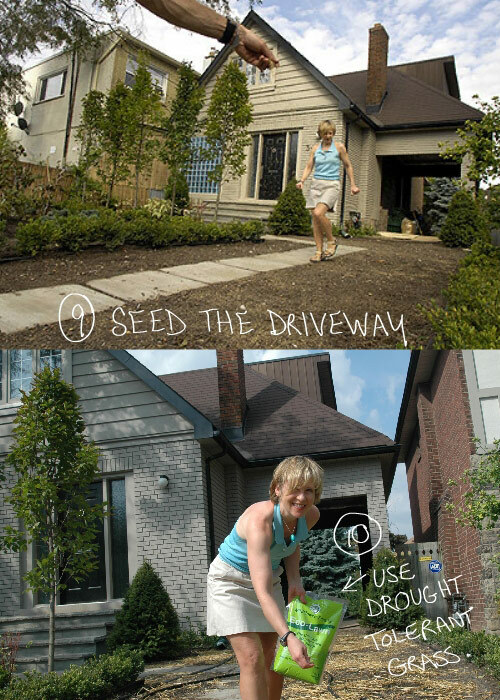 By using this product, our driveway can look just like a green lawn, but actually be load-bearing. This allows vehicles to drive on it without causing ruts or damage to the grass. Each plastic paver measures 13″ x 13″, with a depth of 1 1/2 inches. The main concept to understand is that grass seed and soil goes inside each honeycomb cell. (You can place other materials in the cells such as ground cover, or even gravel and pea stones.) The opening on the bottom allows for grass root penetration and development. Once the grass has taken root and grown, the surface appearance is that of any lawn. In addition to driveways, it’s been used for parking areas, access roads, fire lanes and scores of other novel applications. But the pretty green PermaTURF isn’t intended to stay visible. So in Step 6, we filled the panels with a mixture of 30% sand and 70% loam (see below). With that mix of sand and loam on top you’d never know the panels were under there. [in progress photos] The final step in creating the green driveway, is to fill the panels with grass seed. 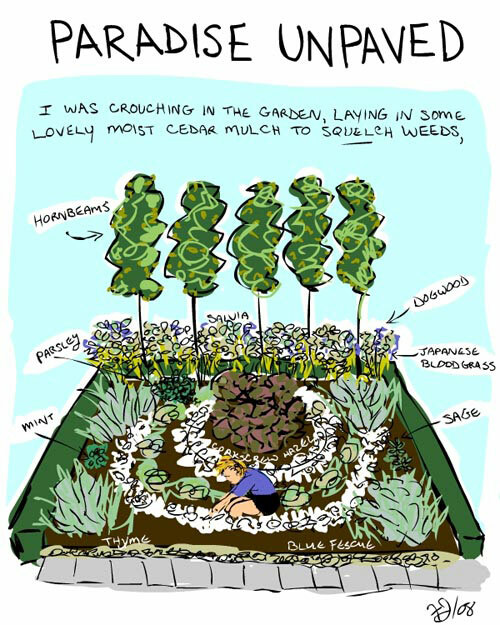 Using sod would create an instant green driveway — and I considered it. But it’s not recommended for our cold winters because the roots don’t go down as far as with grass grown from seed. However the irony is that our summer weather is so hot (forecast today is 91F/ 32C), that it’s recommended that we wait for cooler weather to plant the grass seed. 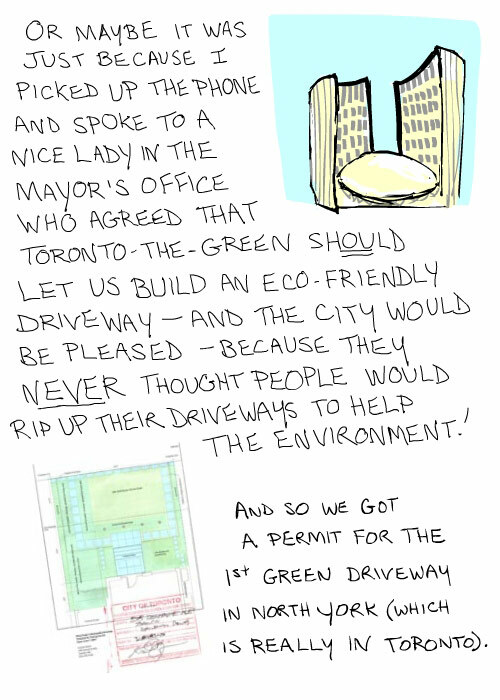 Let me know if you build a green driveway. We are very happy with our decision to use PermaTurf, (quality, availability, customer service) but there are other products that are similar to it. Good luck! Thanks for being such an inspiration, and for being so awesome, Franke. All we have to do is show what can be done, and people will learn from each other. There is hope. There really is. This is a beautiful story. I love what you have done and would love to do the same when I get out of my condo into a house with a driveway. More power to you and hope you continue to inspire all who see your beautiful green garden or read your story. That’s really informative and inspirational — thanks! LOVE LOVE LOVE THIS!!!! Made my day. Hooray. What a great story. I’m sharing it with everyone, and will get to work on my own green driveway. I just mowed my driveway for the first time. Yeah!! CONGRATULATIONS! 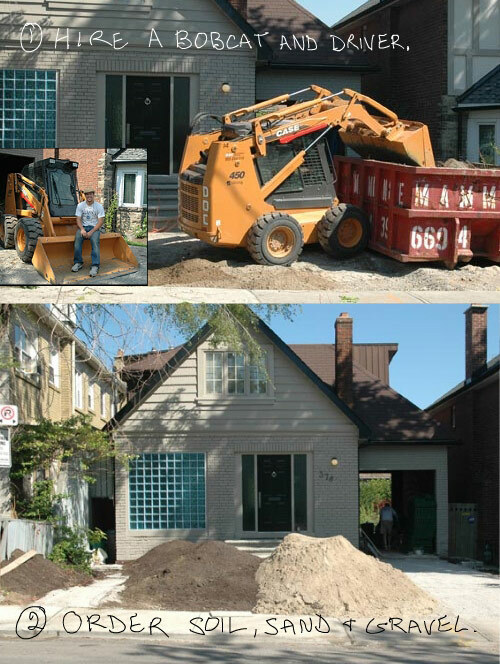 How exciting to read about the building of your green driveway. I’m thrilled that we played a part in inspiring you! 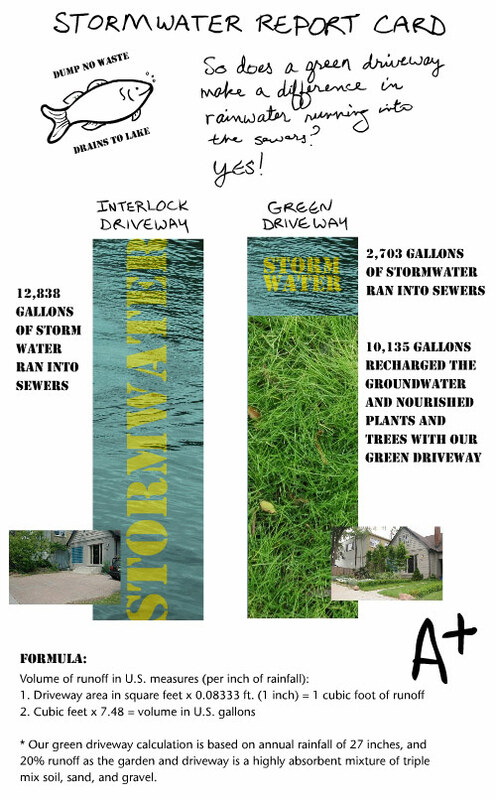 Our green driveway has helped with our water issues too. We waterproofed around our house, put in a bigger sump pump, “naughty french” drains ;-) and even new drains to the “stack” (a term I didn’t know until we needed to put the drain to it). Like yours, it’s been quite an adventure! Thanks so much for sharing your tremendous story. What’s next? This is awesome, and most inspiring! I’ve been interested in rain water reclamation for years. Using this method over a pan that drains into a cistern is just what I’ve been looking for. I can see using it as a driveway, patio, even in low-lying areas where water runoff naturally collects, then re-using the water for things where municipal water would normally be used. Very cool way to communicate ideas! 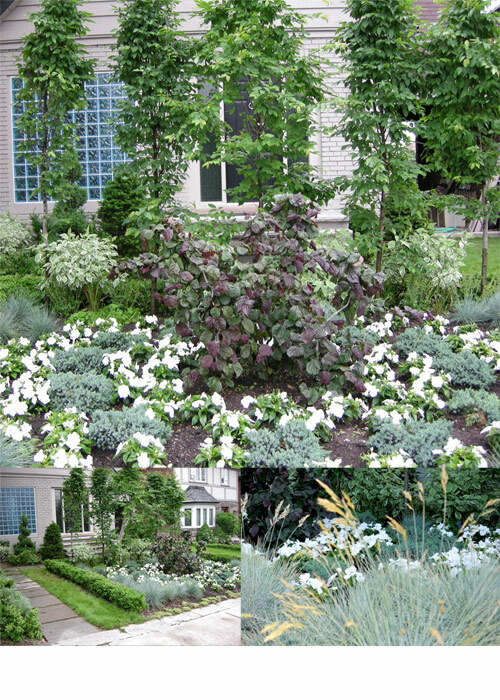 I came across your website a couple of years back, and really liked your idea of putting down a green driveway. 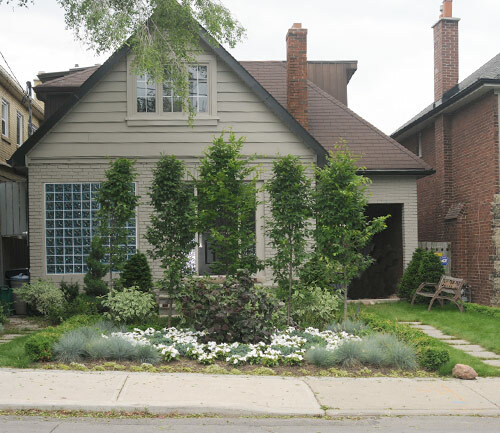 I’ve recently purchased my own house in East York, and I’m hoping to do something similar. 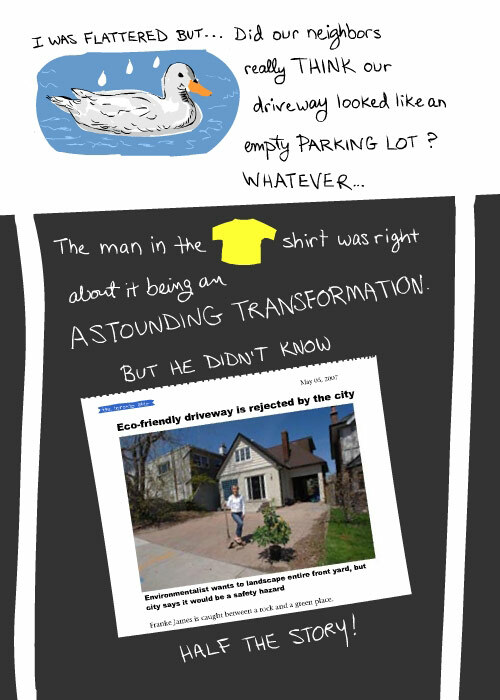 We have a mutual driveway shared with our neighbour, and it expands in our backyard into 2 parking spots — but we have no car! I can’t do much about the shared driveway, but I want to replace those paved parking spots with green parking spots — essentially, grass that my visitors can park on. In the past week, I’ve started contacting landscape contractors with experience putting down PermaTurf and similar products. The one part I’m hoping you can share with me is the part where you contacted City Hall and got a permit for what you did. It isn’t obvious to me which department I’d need to contact to get things going. Was there anyone specific that you spoke to who familiar with your pilot project, so that they’d know what I was talking about when I described my intentions? This is such an inspiring, real world happening. 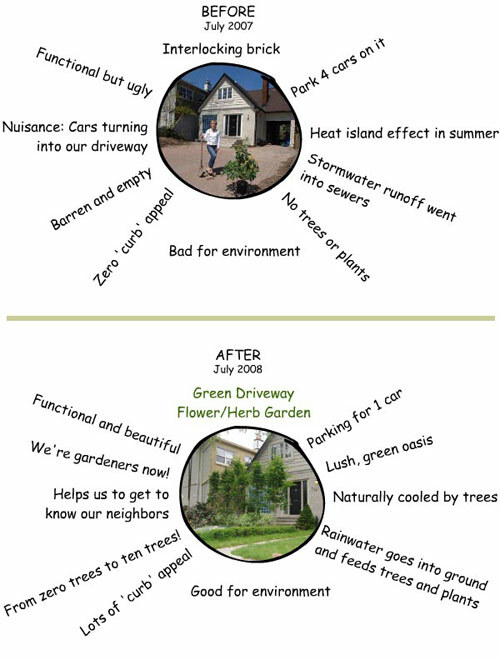 Small bits really help and you helped the environment twice (once by stopping using the SUV and then by unpaving the driveway). Very great and full of fruits! 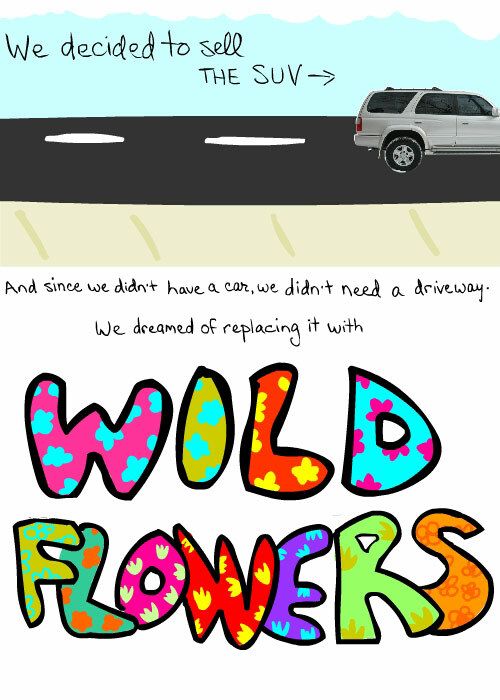 I love this story! Good for you! What is you next project? Go organic! This is a terrific story and great project. Very inspirational! From everyone here at Sckoon Organics we say Bravo To You! I always find myself grinning from ear to ear when I experience your work, Franke! I so hope that Joni sees this. Her timeless lyrics and your progressive vision are the best 1970 and 2010! How can 40 years have slipped by and we still don’t have an energy bill? I loved reading and sharing today your graphic essay and review of Eric Pooley’s NYT best-seller, The Climate War. Simply fantastic! I hope every local, state, and national legislator reads it too. You’re a star! that’s an inspiring story, thanks! 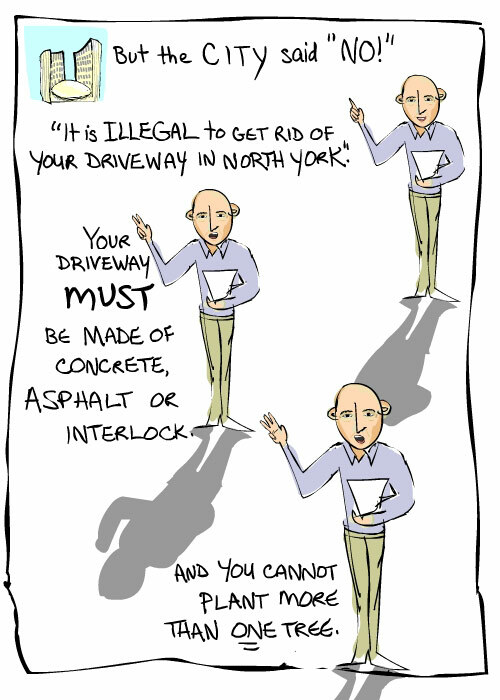 This is a sweet illustrated narration of a Toronto family’s transformation of their driveway into a garden, and the nonsensical bureaucracies they overcame. I really love to see the entire story all in one place and it’s so beautiful !!! What an example you are !!! 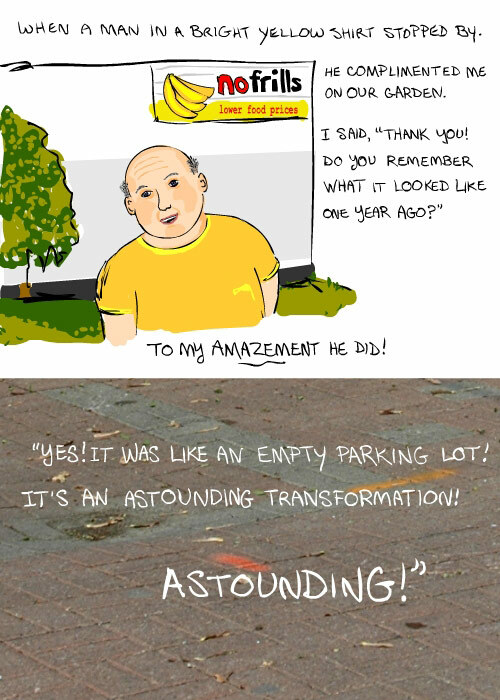 Congratulations on getting approval of your green driveway, and I like finished design. It is both green and inspiring. This is amazing and I would like to do the same I am just wondering about shoveling the snow off in winter and how it would survive. Thanks for your comment and email re: Winter. I have a post about our all season driveway. We don’t shovel ours — but we could. 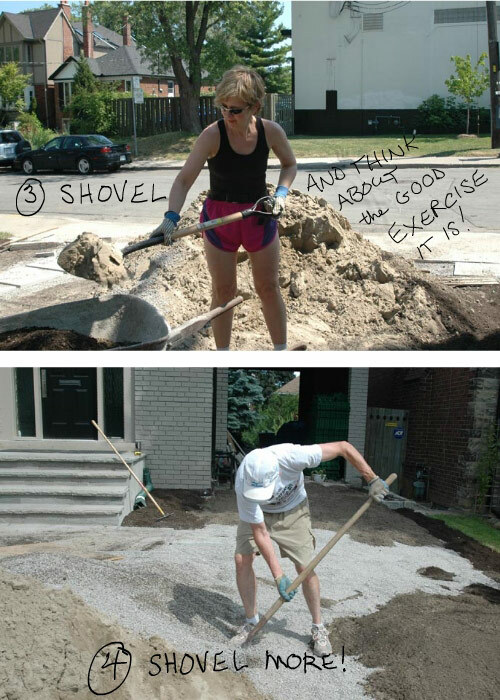 “Many people ask us if we shovel our green driveway. 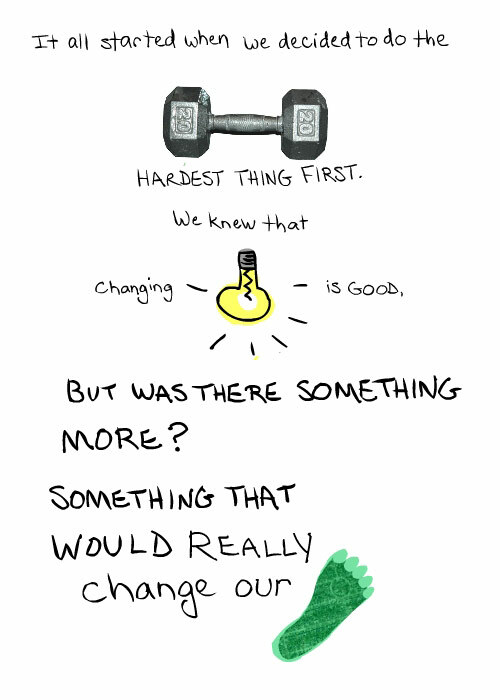 We could… but we don’t usually. (See My SUV and Me Say Goodbye) But if you want a green driveway and want to keep shoveling through the winter, go ahead. You can do it! It’s okay to shovel the grass because the roots are protected by the PermaTurf, and cannot be damaged. PermaTurf is located in New Hampshire, which gets lots of snow. They tell me they have many customers who regularly shovel their green driveways. The grass was well-established within 5 weeks. Simply amazing, I am astounded at your efforts Bravo, Bravo!! My 4yr old son thanks you! Madame James…Face à l’intelligence, à la logique et simplement au bon sens…nos gouvernements et incontestablement, notre gouvernement Harper actuel (le plus idiot et bouché qu’il ne nous a jamais été permis de subir) montre son vrai visage…le visage de l’absurde total. Mon Dieu…!!! s’il existait une baguette magique, même à l’unique pouvoir de faire disparaître les choses ou être vivants…je la pointerais illico vers notre cher Premier Ministre Harper. Bravo Mme James…je vous appuie totalement. Isn’t it funny that the right wing of the political spectrum always claims to be the defender of liberty and freedom? Franke, you are WONDERFUL! I’ve just stumbled across this! You MADE my day! Big hugs and kudos to you! This is pretty much what my wife does for a living. You folks rock. It is because I referenced Louise Livingston the work that the Puget Coop has been doing for the last 50 years (http://www.pccnaturalmarkets.com/sc/1202/paleolithic_diets.html) and the fact that Stephan Guyenet PhD spent some time informing the members about a better life style and eating habits, and she sending me a list of speakers for the next couple of months to forward to our members of the NFU, that I learned about your driveway. Don’t ask how I got there. I may be 70 years old but I am sometimes like a kid, when I come across a link, I’ve got to click it to see what’s behind it. And before you know I have produced a horribly long sentence, with so many subclauses that I have to backtrack in order not to lose my way.That’s how I arrived in your absolutely beautiful driveway. We are eagerly looking forward to seeing you here in Belleville on March 30. Franke, Your driveway and your endeavour is an inspiration for all of us. I teach in North York and we are currently learning about the Tar sands of Alberta. 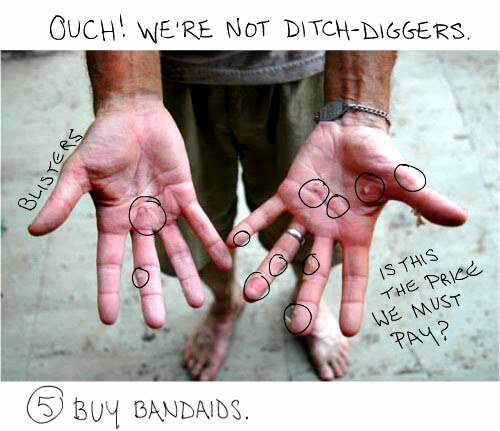 I hope to draw from you graphic essays to show my students all that is at stake. Thank you! I am very impressed with your green driveway. I am also very impressed that you went about it without a “fighting city hall” attitude, but chose to approach the challenge of changing the law(s) in a positive manner. As the saying goes, “you can catch a lot more flies with honey than vinegar”. Media attention done “right” can be helpful too, as long as they also approach the problem in a positive manner. Hopefully more and more people will see the benefit of your efforst and join the tide of people “going green”. This is so inspirational! We want a bigger space for our 3 boys to play soccer, so making our driveway space into grass is the perfect solution! Sorry- you may say this already somewhere, but where can one buy PermaTurf in the GTA? What I would like to know is what company did you actually get the green pavers from? Having a terrible time sourcing them out. 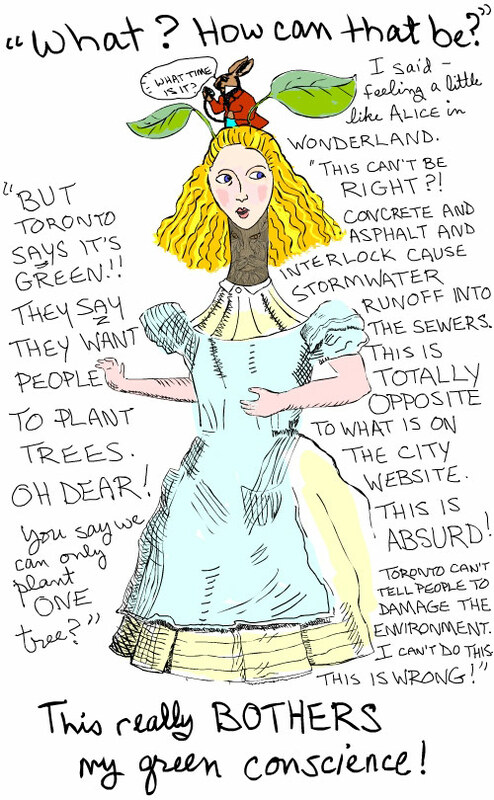 Thanks to the TRCA, I’ve found the Green Avenger! Seriously, I want to build the case for a new category of “green parking pads” for front lots in East York semi-detached territory. I would like to consult Franke about the process and of course putting together a proposal if we go ahead and appeal the moritorium on parking pads at City Council. Thank you for your thoughts in advance.